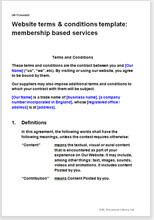 This template provides T&C for a website that offers a membership based service. You could charge a subscription or provide some or all of the services for free. The template includes terms that help you to comply with the Competition and Consumer Act 2010 making it suitable whether your members are private individuals or businesses. For clarity, we set out the cooling off rights that your customers have under the Competition and Consumer Act 2010.